Police investigate the explosion in Zhangjiakou, Hebei province, on Nov. 28, 2018. Staff at a Hebei chemical plant where an explosion killed 24 and injured 21 have been accused of hiding evidence and misleading investigators. 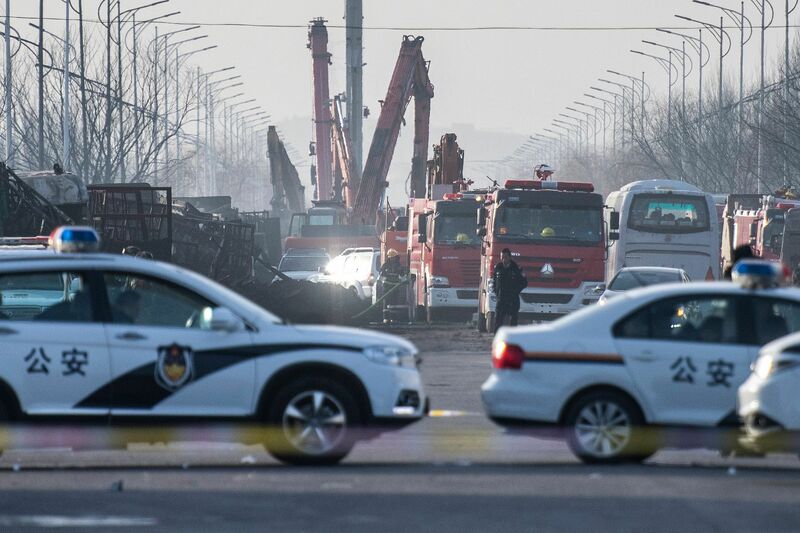 Poor maintenance contributed to a vinyl chloride leak that caused the deadly blast at a Hebei Shenghua chemical plant in November, investigators said in a provincial government report (link in Chinese) published online Sunday. The report, released by Hebei’s Department of Emergency Management, said closed circuit television footage showed a plant manager watching videos on his phone near the site of the leak just two hours before the explosion. But it said there was no obvious sign of a problem until around 5 minutes before the blast. In the aftermath of the blast, Shenghua employees had told Caixin reporters that their plant was not responsible (link in Chinese), and even suggested that a neighboring energy company may have caused the explosion. Police have detained 12 staff, including the firm's Communist Party chief and its general manager. The provincial government has recommended that Zhangjiakou city's Bureau of Emergency Management revoke the company’s license, and called for a penalty of 9.49 million yuan ($1.41 million) to be levied on the company — 5 million for the explosion, and 4.49 million for hiding evidence and misleading authorities. The explosion caused an estimated 41.48 million yuan in damage. Hebei Shenghua Chemical Industry Co. Ltd., a subsidiary of state-owned chemical giant China National Chemical Corp. Ltd. (ChemChina), has more than 1,300 employees. Three ChemChina officials were also reprimanded, the report said.